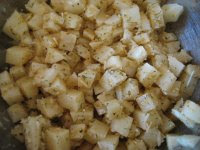 You can make them spicy if you like by adding a few chile flakes or adding different herbs such as rosemary. 2. Peel and wash potatoes. 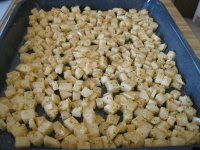 Dice potatoes in small cubes (about 1/2 inch thick or so). 3. 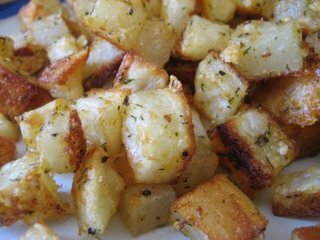 Add olive oil and toss to coat all potatoes. Add the rest of the ingredients and toss to mix. 4. 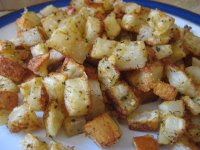 Place potatoes in a single layer in a 13x9 pan. 5. Bake for 40 -45 minutes or until nicely golden brown. Time depends on how small you cut the potatoes. Enjoy!